Pet-eating predator reappears in Mass. 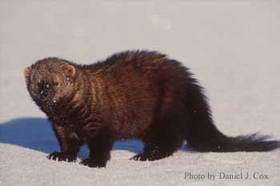 Weasel-like predators called fisher cats -- voracious housecat-eating cousins to the ill-tempered wolverine -- have reportedly returned to Massachusetts. The predators were largely eliminated in Massachusetts during the 1860s, but sightings have become increasingly common during the past decade, the Boston Herald reported Thursday. A Sandwich, Mass., police officer found the carcass of what he first though was a large cat or small dog along side a state route Tuesday. The carcass was identified as that of a fisher cat. "It's the first time we've had actual documentation," Judy Ellal of the Cape Wildlife Center told the newspaper. "We've had sightings, but no photos to prove they exist here. She said the fisher cat weighed 11 pounds and was 23 inches long, with a bushy 15-inch tail. Along with foxes and coyotes, the nocturnal animals pose a threat to cats and small dogs, the Times said. What happens when wildlife species take up residence in densely populated areas?